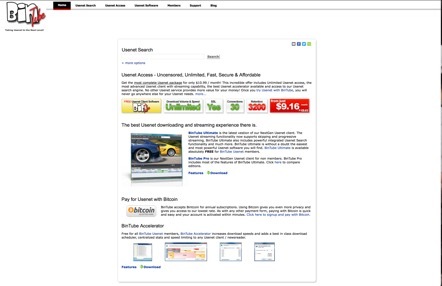 BinSearch is one of the best binary Usenet search engines. Its AI crawls through thousands of popular Usenet newsgroups and adds it to its database, where you can easily find it by doing a quick search. While some BinSearch alternatives just index text discussions, BinSearch stores information about any binary file it finds posted in the newsgroups. Finding what you need can be down in two ways: you can use the search function if you know what you are after, or you can browse individual newsgroups until you find something you like. BinSearch was created as a private project for personal use, but the administrators decided to make it public for everyone to enjoy for free. Among its many features, it has RSS support, NZB file creation, and watch release. It is the most popular Usenet search engine around and very useful if you are trying to quickly search for one binary file in particular. But if you’d like to try other alternatives here are some of the best. Usenext was the first service that made Usenet available to the masses and has helped innovate the industry. It gives you access to over 25 petabytes of data, with 3,000 days retention time. Security is top-notch, since everything is protected by 256-bit SSL encryption, and there are six server farms to provide the fastest speed possible. You can reach speeds of up to 800 Mbit/s! While some shady alternatives keep track of all your info, UseNeXT values your privacy and does not store your IP address. All the data is uncensored, and their customer support is one of the best. You can contact them by an online form, or give them a call. There are several membership plans, each one with a specific amount of data you are allowed to download per month. But the remarkable part is that you can try this service for free. Sign up for a 14-day trial and test everything the Usenext has to offer free of charge. 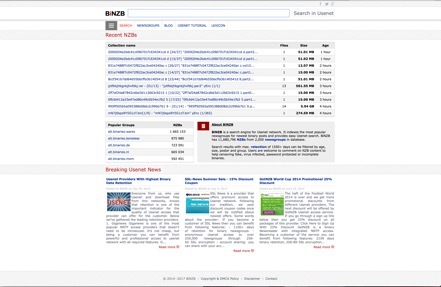 BinTube is not just another Usenet Search Engine like BinSearch, but a complete suite of tools designed to make your Usenet browsing a full experience. Among the features it includes are a Usenet reader, an accelerator to improve the download speed of your files, unlimited downloading, free SSL encryption, and much more. If you’d like to keep your subscription private, there is the option to pay with Bitcoins to have complete anonymity. Retention is for 3,000 days, so whatever you search for, you will probably find it. If you already use a Usenet reader it will be no problem, BinTube has a broad compatibility, so you are free to choose any newsreader you prefer. While many BinSearch alternatives offer a series of membership plans and sometimes picking the best one is not so easy, here you only have one. After you subscribe, you are ready to go and have unlimited access to all of BinTube’s features. At this Usenet search engine, you’ll find over 11 million NZBs from over 2,000 newsgroups, with a maximum retention of 1,500 days. The results can be filtered by group, age, poster, group, and other factors, and users can make comments on the files to warn others about fake or incomplete binaries. If you are new to the Usenet world, this BinSearch alternative has some useful pages you should read. 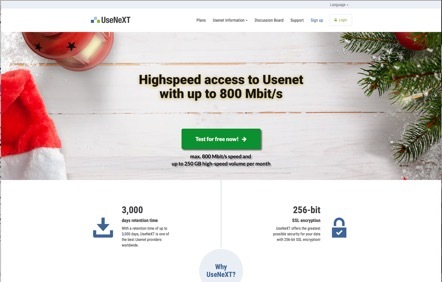 On the Usenet Tutorial page, you can learn how to download by following three simple steps: getting Usenet access, searching for a file, and downloading it. The Lexicon page has the meaning of the most common Usenet related terms. If you want to know what Alt, Retention, or NNTP mean, you can read about it there. To keep up with the latest Usenet and P2P news don’t forget to visit their blog page, which also offers coupons and discounts for many Usenet readers and downloaders. Besides the usual Usenet search engine, NZB also has an enthusiastic community that is pretty active in its forum. But while other websites like BinSearch at least let you take a look around the place, this one has a restricted access and only after you create an account will you be able to enter. As a free member, you will have lots of limitations, so it is best to get a paid membership. You can choose between a 6-months, one-year- or two-year plan. Once you subscribe you will get free custom searches, spam filtering, giveaway competitions, and the possibility of requesting any file you have failed to find elsewhere. The index is updated every few minutes, and there are no ads to interrupt your browsing and searching. If you want a Usenet search engine that is friendly and community-oriented, this is the one to choose. It provides excellent value for the money in both the indexer and the forums. NZBplanet claims to be “The best NZB indexer.” It is all a matter of opinion, but we can tell you that it has been a top-ranked website since it was launched back in the year 2012. You can open a free account, but will only be able to download five files and will see ads all over the site. A VIP membership removes this limitation and also gives you an ad-free experience. The indexer runs every 15 minutes, and there are many great features you might like: HTTPS security, IRC channel, API integrations, and more. The community is active and helpful; there is always someone at the forum who can help you out with any issue. They also have a Site Status page where you can verify that the website, API and RSS are operational and working as they should. Want the best binary search engine sites like BinSearch but also a quick and straightforward way to search? Then you will like NewzLeech. Their interface couldn’t be simpler: all you have is a search bar where you type your query. You can search for files, or for Usenet groups, and all your searches are private. There are no logs kept so your searches are anonymous. The site uses a near real-time index; data is updated continuously, so you always get the freshest results. If you want to narrow down your results, just use the Settings page, where you can set your preferences and filter by age, min or max size, and decide if you want advanced options to be shown, as well as how many findings you want to have per page.